With more than thirty years business experience and solid partnerships with over forty of the finest quarries around the world, American Slate is one of the largest and most reputable sources of natural slate, sandstone, limestone and quartzite in the United States. Founded in California in 1979, the company has grown to encompass locations across the country. Our product selection is correspondingly broad and encompasses over sixty naturally stunning colors and textures. We maintain our industry leadership by continually searching the globe for new partners and products that inspire you with their beauty and meet your highest standards for performance. Every piece of American Slate is handcrafted and one-of-a-kind. We have a heritage of bringing innovative mining and processing techniques to our quarry relationships and enjoy the full cooperation of our partners in ensuring the premium quality of our natural stone products. 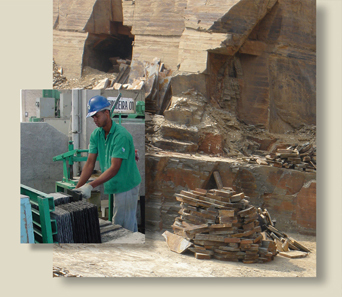 The industry’s most stringent inspection requirements distinguish American Slate. Our strategically located warehouse facilities empower us further to deliver a level of service appropriate to our premium products. American Slate’s commitment to quality extends to the lives of the miners and craftsmen who work in our partner quarries. More than a quarter century ago — long before there was any public outcry on the issue — American Slate took a stand against child labor and other unfair labor practices. We maintain our position unequivocally and work only with those quarries that share our humanitarian values. We welcome your inquiries and would be delighted to have the opportunity to discuss why American Slate is the right choice for your next project — and for our times.